While Cambodia's star attraction is the fascinating temples of Angkor, visitors should consider looking at another wonderful attraction - Tonle Sap. Tonle Sap is a lake and river system that's unique and special to Cambodia. The river flow changes direction twice a year! During the dry season, it flows out into the Mekong River, while during the wet season, the Mekong overflows, and the river backs up to form the huge Tonle Sap lake. 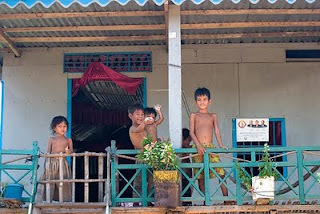 There are a couple of villages on and along Tonle Sap that is certainly worth visiting. 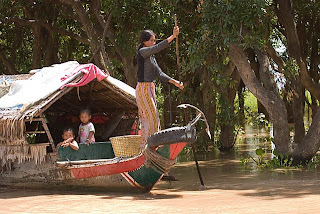 Most tours and guides would bring tourists to Chong Khneas, a floating village. 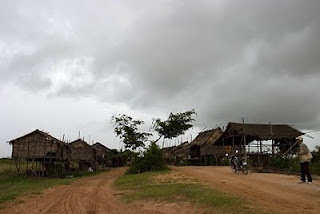 However, I visited Kompong Phluk instead, a village that will appear different depending on which season you go! 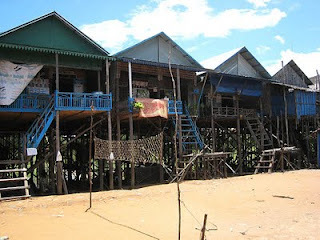 In the dry season (when I went), Kompong Phluk appears as a village of wooden houses on stilts. Life is more grounded, and they even have ball games below their houses. However, when the water level rises, the stilts disappear from view, and you would just see wooden houses "floating" on water! In fact, during this wet season, Kompong Phluk can only be visited by boat. There are also other smaller villages along the causeways of the river. These villages usually consists of small thatched huts which are easily dismantled and moved. The families in these villages move home several times a year!! A visit to Kompong Phluk really provides a good way to look at the the lifestyle of these people who are so dependent on the lake and river. If you visit during the dry season like me, getting there is also challenging. Taxis and tuk-tuks can only bring you to the village of Roluos, where you will then transfer to a motorbike. This motorbike will bestow upon you your most bumpy ride ever, on a ground that will not be visible during the wet season. Subsequently, you will still need to transfer to a boat to take you to Kompong Phluk itself! 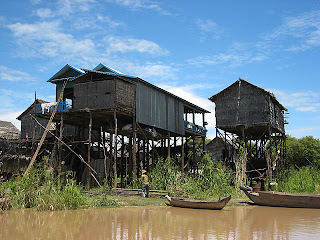 Do check out the villages of Tonle Sap if you have enough time in Cambodia. For more info, you can check out Tales of Asia website, or your favourite guidebooks and online travel resources.